The stock slipped 5% to Rs 251 on Thursday, falling 11% in past two trading days on BSE, after the rating agency ICRA on Wednesday downgraded the airline's loan and debenture ratings. Shares of Jet Airways (India) slipped 5% to Rs 251 on Thursday, falling 11% in the past two trading days on BSE, after the rating agency ICRA on Wednesday downgraded the airline’s Rs 10,963 crore loan and debenture ratings. 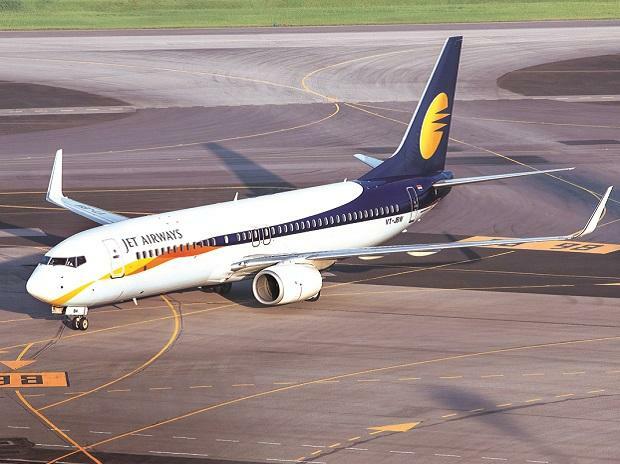 “ICRA has revised the long-term rating (assigned to long-term loans and non-convertible debentures) to D from C. The short- term rating has been revised to D from A4,” Jet Airways said in a statement. This rating downgrade considers the delay by Jet Airways in the payment of interest and principal installment due on 31 December 2018 due to cash flow mismatches and delays in the implementation of proposed liquidity initiatives by the company. Jet Airways on Tuesday after market hours said that the payment of interest and principal installment due to the consortium of Indian banks (led by State Bank of India) on 31st December 2018 has been delayed due to temporary cash flow mismatch and the company has engaged with them in relation to the same. “The company has already been delaying its employee salary payments and lease rental payments to the aircraft lessors. Furthermore, the company has large debt repayments due over December 2018 to March 2019 (Rs 1,700 crore), FY2020 (Rs 2,444.5 crore) and FY2021 (Rs 2,167.9 crore). The company is undertaking various liquidity initiatives, which includes, among others, equity infusion and a stake sale in Jet Privilege Private Limited (JPPL), and the timely implementation of these initiatives remain critical to its credit profile,” ICRA said in a statement. Jet Airways continues to have negative net worth due to accumulated losses and diminution in the value of its investments in its subsidiary Jet Lite (India) Limited. Furthermore, the liquidity strain has aggravated due to delays by the company in the implementation of its liquidity initiatives. In the absence of adequate cash accruals, the company will be required to refinance its repayments falling due. While it has been undertaking several liquidity initiatives, timely funds tie-up is a key rating sensitivity. Timely implementation of proposed liquidity initiatives by the management to alleviate its liquidity strain would remain critical to its credit profile, it added. The stock of Jet Airways has underperformed the market by falling 28% from its recent high of Rs 347 on November 16, 2018, after Tata Sons, the holding company of Tata Group, clarified that no proposal has been made for acquisition of controlling stake in airline company. The S&P BSE Sensex was up 1% during the same period. Jet Airways had touched a 52-week low of Rs 163 on October 1 and a high of Rs 884 on January 5, last year.